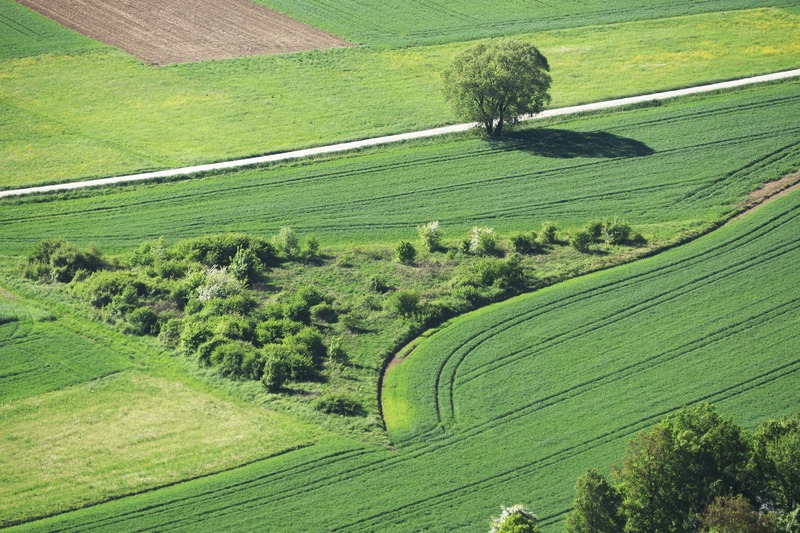 National, regional and local authorities can improve integrated spatial planning and coordinated management between sectors to reduce the pressures from land conversion, mitigate and adapt to climate change and to ensure that GI and biodiversity enhancement become an integral part of spatial and territorial planning. Clear methodological guidelines, training and participatory approaches are needed to advance the transition towards integrated spatial planning. Member States and other stakeholders can benefit from geospatial methods, data and maps in support of the strategic deployment of GI from sub-national to EU levels. Two mapping approaches — physical and ecosystem-based — and three key GI principles — connectivity, multifunctionality and spatial planning — apply at all scales from urban to rural landscapes. 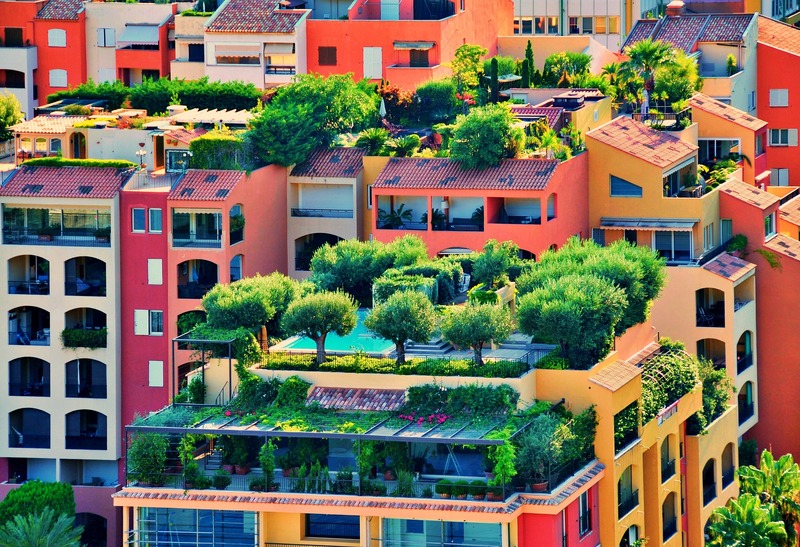 Adopted in 2013, the EU-wide strategy on GI — Green infrastructure: Enhancing Europe’s natural capital — promotes investments in green infrastructure ‘… to maintain, enhance or restore the health of ecosystems, ensure that natural areas remain connected together, and allow species to thrive across their entire natural habitat, so that nature keeps on delivering its many benefits to us’, and to deliver a wide range of ecosystem services. The Joint Research Centre (JRC), the EEA and the Directorate-General for Environment of the European Commission have published a joint report showing how geospatial methods, data and tools can be used at various geographical scales for strategically deploying GI and ecosystem restoration in the context of ecosystem management and integrated spatial planning. The report analyses a number of case studies, which show how these multi-source and multi-scale data, methods and tools can be applied. It provides guidance for the strategic design of a well-connected, multifunctional and cross-border GI and identifies knowledge gaps. ensuring the multifunctionality of ecosystems for the long-term delivery of multiple ecosystem services such as climate change mitigation, sequestration (greenhouse gases, air pollution) and recreation. Mapping GI to support and enhance nature conservation beyond protected areas and across country borders, and to look at how well connected protected areas are and whether connectivity enhances biodiversity (see action 6 of the EU biodiversity strategy) and the delivery of ecosystem services. Spatially explicit mapping methods can help identify key corridors between protected areas and can help determine the best conservation strategies for designing new protected areas, enhancing conservation corridors or implementing restoration measures (and improving landscape permeability) in unprotected land. Planning GI for different purposes, for example as a cross-border, dynamic and resilient network to mitigate climate change. The network of EU protected areas, acting as the backbone of the EU GI network, can be assessed and designed to respond to shifts in species range in the context of climate change. Deploying GI in the rural landscape in a well-connected and multifunctional way by prioritising actions for conservation and restoration, enhancing landscape permeability and prioritising defragmentation measures to mitigate the impacts of agricultural intensification and road infrastructure on species movement. Data sets and tools are now available for use in individual European countries and regions as well as in EU-wide assessments. Deploying GI in large urban areas and regions, planning green and multifunctional urban spaces and other forms of GI that improve people’s well-being. Tools for urban mapping, including connectivity measures, can assess the territorial and ecological coherence between urban and peri-urban areas. Exploring GI for enhanced biodiversity and ecosystem service delivery through spatial modelling of land use change in response to demographic, economic and agricultural developments, including finding trade-offs and helping to resolve conflicts in decision-making on land allocation involving all sectors. Monetary assessment of the costs of prioritisation measures and the benefits of GI for society. This may encourage the uptake of GI projects as cost-efficient alternative solutions to grey infrastructure or for prioritising natural/semi-natural land reallocations in the agri-environment and forestry contexts (greening measures). Integration of GI maps at different scales to show fragmentation patterns and the connectivity of recommended GI landscape components, which can be assessed jointly with the provision of ecosystem services. Local and regional assessments represent the scale of action and implementation of measures; they require fine-grained, accurate and detailed data. The large-scale (and less detailed) mapping of GI is appropriate over large regions on matters of national or trans-border relevance, such as defragmentation measures, planning of highways and territorial cross-border coherence to ensure the connectivity of protected areas or targeted ecosystems (woodlands, riparian vegetation along rivers, etc.). whether it is possible to build a coordinated GI network that enhances multiple benefits for nature and humans. Based on the work of De la Fuente et al. (2018), Rodríguez et al. (2018) and Maes et al. (2015), a number of maps and spatially explicit products have been produced. Figure 1 shows a map of the four categories of corridors of variable width between the N2000 woodland sites in mainland Spain. The corridors are mapped at a spatial resolution of 100 m to show connectivity with a resistance surface (i.e. one that makes it difficult for forest/woodland mammals to move through different types of land cover). To visualise the connectivity of the N2000 sites, the key corridor sectors outside N2000 areas are shown in Figure 2. This subset of corridors in Figure 2 corresponds to the 25 % of all corridors that contribute most to connectivity. Together, they provide the majority of connectivity between N2000 woodland sites. The lines along the central axis of the corridors were also considered indicators for evaluating ecosystem service provision. Source: Reprinted from De la Fuente et al, Copyright 2018, with permission from Elsevier. Map metadata and other formats. Figure 2 indicates, from red to dark blue, corridors with an increasing number of ecosystem services (i.e. erosion control, crop pollination, water retention and outdoor recreation) above the average seen outside N2000 areas. Source: Estreguil et al. (2019). Copyright European Union 2019. Most of the key corridors between N2000 sites deliver multiple ecosystem services and have high potential to become part of a European GI network. In Figure 2, corridors in blue and yellow identify areas that are suitable for promoting connectivity while delivering multiple ecosystem services. Transboundary corridors are important for both connectivity and ecosystem service delivery. The results highlight the importance of the transboundary corridors, crossing mainly to Portugal (and to a lesser extent to the French side of the Pyrenees) to connect different N2000 sites in Spain. These corridors not only guarantee the connectivity of N2000 areas but also contribute to the delivery of multiple ecosystem services at an increased spatial scale. The mapping shows the need for coordinated restoration actions for connectivity and ecosystem services. Corridors in red and orange in Figure 2, which represent only 2 % of the total number of corridors, increase the connectivity of the N2000 sites but deliver a limited number of ecosystem services, lower than the average delivered by landscapes outside N2000 sites. Given the connectivity importance of these corridors, specific restoration measures might be considered to increase the number of services delivered. However, the restoration measures applied should be aligned with the local/regional demand for each specific ecosystem service. There is potential for building a multifunctional European GI. This case study is a useful example of integrating the connectivity of the N2000 network and ecosystem service delivery, which could be further developed at EU level to improve decision support for the GI initiative. It shows that it may be possible to build a multifunctional European GI from the N2000 sites and the corridors between them that safeguards both connectivity and the provision of multiple ecosystem services. De la Fuente, B., et al., 2018, ‘Natura 2000 sites, public forests and riparian corridors: The connectivity backbone of forest green infrastructure’,Land Use Policy 75, pp. 429-441. EEA, 2014, Spatial analysis of green infrastructure in Europe, EEA Technical Report No 2/2014, European Environment Agency. EEA, 2015, Exploring nature-based solutions — The role of green infrastructure in mitigating the impacts of weather- and climate change-related natural hazards, EEA Technical Report No 12/2015, European Environment Agency. Estreguil, C., et al., 2014, ‘A proposal for an integrated modelling framework to characterise habitat pattern’,Environmental Modelling & Software52, pp. 176-191. doi: 10.1016/j.envsoft.2013.10.011. European Commission, 2014, Mapping and assessment of ecosystems and their services — Indicators for ecosystem assessments under action 5 of the EU biodiversity strategy to 2020. European Commission, 2018, Mapping and assessment of ecosystems and their services — An analytical framework for mapping and assessment of ecosystem condition in EU. Forest Europe, 2015, State of Europe’s forests 2015. Status and trends in sustainable forest management in Europe, Ministerial Conference on the Protection of Forests in Europe, Forest Europe Liaison Unit, Madrid. See in particular part II, criterion 4, indicator 4.7. Liquete, C., et al., 2015, ‘Mapping green infrastructure based on ecosystem services and ecological networks: A pan-European case study’,Environmental Science & Policy54, pp. 268-280. 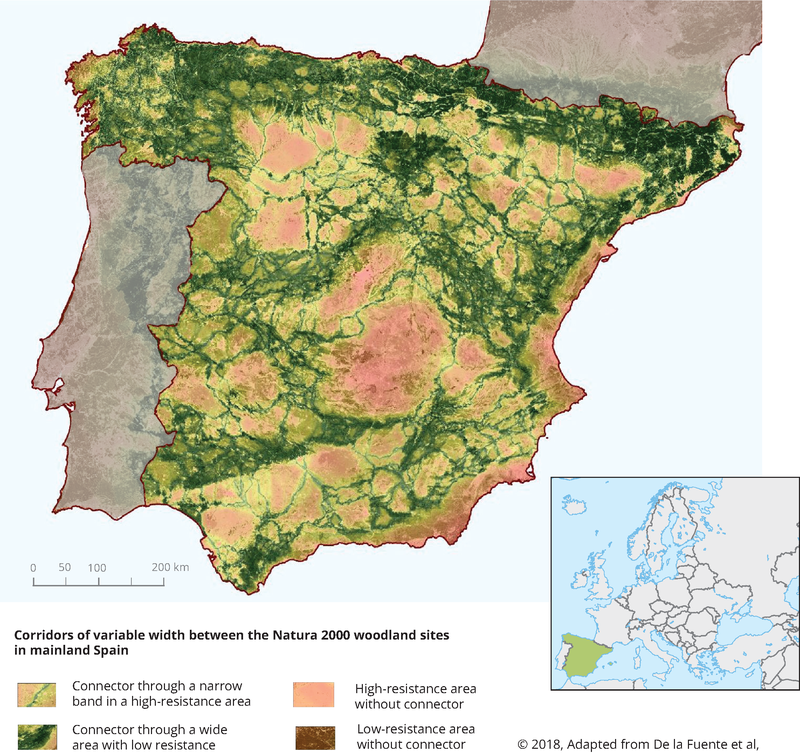 Rodríguez, G., et al., 2018, Wildlife highways: Proposal by WWF Spain for a strategic network of ecological corridors connecting Natura 2000 sites, WWF Spain, Madrid. Further information and maps are available. Vallecillo, S., et al., 2018, ‘Spatial alternatives for green infrastructure planning across the EU: An ecosystem service perspective’,Landscape and Urban Planning174, pp. 41-54. For references, please go to https://www.eea.europa.eu/themes/biodiversity/green-infrastructure/tools-to-support-green-infrastructure or scan the QR code.